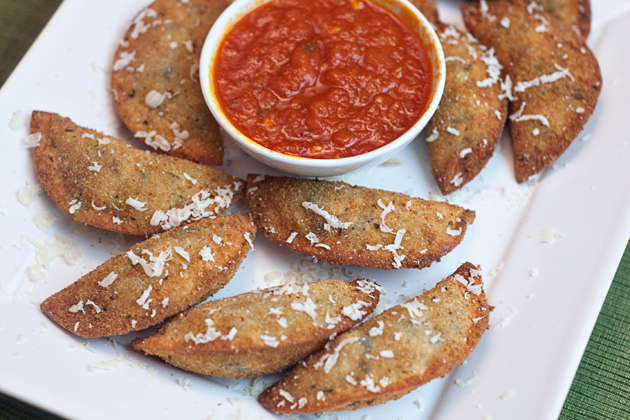 Here is my take on classic St. Louis toasted ravioli. I've added a grilled twist that really works well in the filling. I don't know why these pillows of fried pasta goodness are called "toasted", but I do know that they are very good. I developed this recipe for Stadium Journey as a contribution to their forthcoming pro football cookbook. I'm sure that there are some purists out there reading this and thinking, "Wonton wrappers, what the...?! What a pathetic lazy excuse for pasta!" I understand that it's clearly not traditional, but I've tried making homemade pasta exactly once and it didn't end well. If you like spending the time and having every horizontal surface of your kitchen covered with a dusting of flour, go for it. I'm going the lazy route. Come on, try it, I won't tell anyone. Combine the chicken, spinach, pepper jack, mushrooms, and scallion in a medium mixing bowl and stir well to combine. Whisk the egg and water together in a small bowl. Brush the outer edge of a wonton wrapper with the egg wash, add about a tablespoon of the filling to the center, fold carefully and pinch the edge to seal it. Make sure that it's sealed completely. Repeat with the remaining wrappers and filling. Working in batches of four or five, brush all sides of each ravioli with the egg wash (or dip them), coat each completely with bread crumbs, and carefully drop them into the oil, waiting a couple of seconds between each. Fry the ravioli until they are golden brown. Remove to a wire rack inside a lipped sheet pan that's lined with several layers of paper towels. 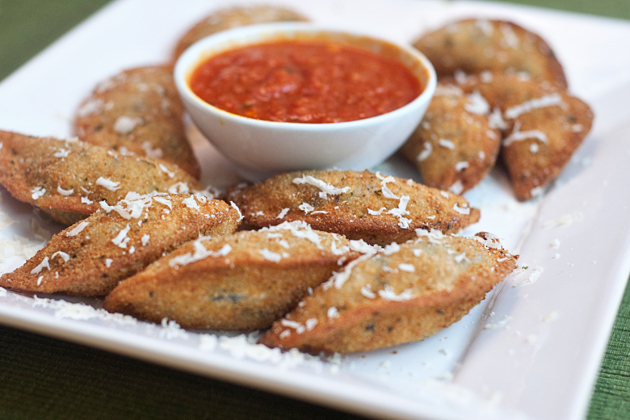 Plate, sprinkle with parmasean, and serve with the marinara sauce for dipping. This sounds great too me. I have absolutely zero problems using wonton wrappers for this, in fact it seems even more appropriate. Sounds amazing. I've got no problems using wonton wrappers, especially since you've attempted home made pasta one more time than me.